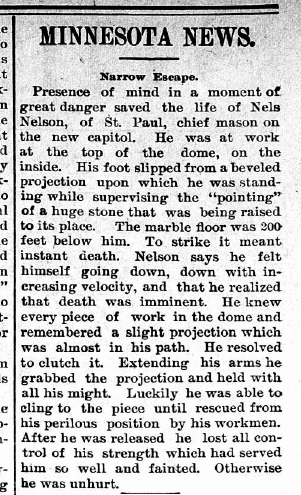 Nils Nelson's "Narrow Escape" | Who Built Our Capitol? Stillwater Messenger, May 3, 1902 p2. Project researcher John Sielaff found this article about stonemason Nils Nelson's close brush with death. He fell from near the top of the dome inside the Capitol and only managed to save himself by his quick wits and detailed knowledge of the building. The article was printed in the Stillwater Messenger on May 3, 1902 p2.